Prescription medication is one of the most common treatment options for panic disorder. Paxil (paroxetine) is one type of medication that is often used to treat panic disorder and other conditions. Paxil belongs to a category of antidepressants called selective serotonin reuptake inhibitors, or SSRIs. SSRIs first became available in the United States in the 1980s and have continued to remain popular ever since. Compared to other antidepressant medications available at the time, SSRIs were found to have fewer side effects while maintaining effectiveness and safety. Other common SSRIs include Prozac (fluoxetine), Celexa (citalopram), and Zoloft (sertraline). As the name implies, doctors originally prescribed antidepressants to help reduce the symptoms of depression. However, some of these medications, including Paxil, are now used to treat both mood and anxiety disorders. Currently, Paxil can be prescribed to treat a variety of conditions, such as aspects of bipolar disorder, obsessive-compulsive disorder, social anxiety disorder, generalized anxiety disorder, and panic disorder (with or without agoraphobia). Serotonin is a naturally-occurring chemical in the brain. As a neurotransmitter, serotonin helps in mood and sleep regulation, as well as other functions. People with mood and anxiety disorders are considered to have insufficient serotonin levels. Paxil works to balance a person’s level of serotonin by preventing brain cells from quickly absorbing it. Through balancing serotonin levels, Paxil can help enhance mood and reduce anxiety. Paxil can also help alleviate the symptoms of some common co-occurring conditions, such as depression or headaches. Paxil will not work immediately to help reduce your symptoms of panic disorder. 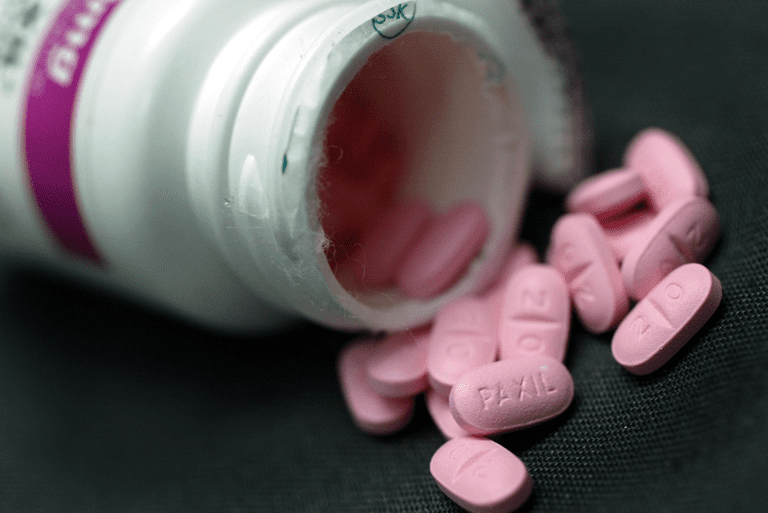 Improvements are typically noticed within several days to weeks of starting your prescription, but it can be several months before you experience the full benefits of Paxil. If you miss your dosage of Paxil, try to take it as soon as you remember unless it is at or close to the time for your next dosage. Never take two doses at the same time; instead, take your regular dose and continue following your dosage schedule. Your doctor can help you to gradually reduce your dosage until you are completely off Paxil. Do not abruptly discontinue your prescription on your own, as this can possibly lead to some withdrawal-like symptoms, including worsening anxiety, headaches, dizziness, and irritability. Black Box Warning: In 2007, the Food and Drug Administration (FDA) issued an alert, warning that SSRI usage may increase the risk of suicidal thoughts and behaviors. The FDA cautioned that this risk is especially an issue for adolescents and young adults who are taking SSRIs. Due to these concerns, young people on SSRIs should be observed for declining mood and suicidal thoughts. Pregnancy/Nursing: It is possible for Paxil to be passed on to a child during pregnancy or while nursing. If you are planning to become pregnant, are currently pregnant, or are nursing, talk to your doctor about the potential risks of Paxil. Alcohol: You should avoid drinking alcohol while taking Paxil. Consuming alcohol can potentially increase the toxicity of Paxil or reduce its effectiveness. Older Adults: When taking Paxil, older adults may be more susceptible to the side effects. An adjustment in dosage may be needed to reduce side effects. The information provided here is meant to be an overview of the use of Paxil for panic disorder. The general information here does not cover all possible scenarios, such as potential adverse side effects, precautions, and contraindications. Always consult your medical provider about any questions and/or concerns you may have about your Paxil prescription. Dudley, William. Antidepressants. San Diego, CA: Reference Point Press, 2008. Silverman, Harold M. The Pill Book. 15th ed. New York, NY: Bantam Books, 2012.